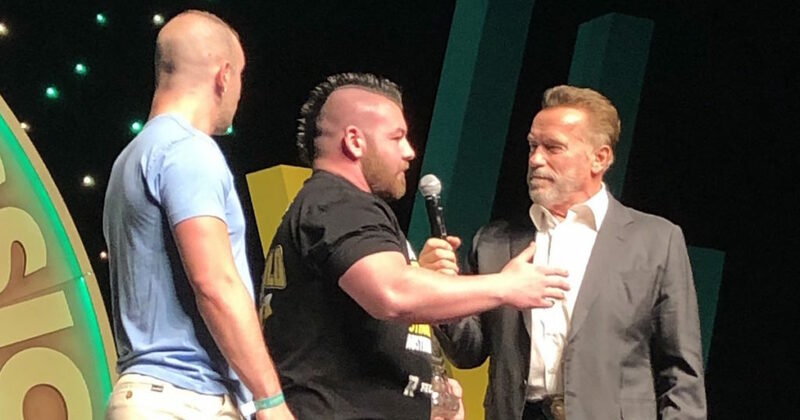 Now that the 2019 Arnold Strongman Classic is in the history books, it’s time to start determining who will compete at the 2020 event. The field is determined in part by the Arnold Pro Strongman Series. Winners of each event earn automatic qualification to the next year’s ASC. The first of these competitions took place at the 2019 Arnold Australia Strongman event. 12 men made up the field and they competed in six events over the course of two days in Melbourne. Here’s how the final results looked after the final reps were done. Kearney started the first day of this event on fire by winning the first two events. He completed the 500kg (1,102 pound) yoke in a time of 13.22 seconds, winning by over four seconds over the rest of the field. He also took the log press max event with a lift of 200kg (440 pounds). Even though he didn’t do as well on the power stairs, he still finished the day with a one point overall lead. He maintained his position on the second day and had a 1.5 point lead going into the final event which was the Atlas stones. Kearney finished fourth by lifting four stones in 75.94 seconds but was still able to take the overall victory by that same 1.5 point margin. Belsak is obviously a force to be reckoned with in any event he enters but was inconsistent here. He started out the weekend by finishing 5th in the yoke but took 2nd in the log press max. He took 4th in the power stairs and would be in 3rd overall in Day 1. He made up a little ground on Day 2 but Kearney was able to maintain his lead so Belsak has to settle for the runner-up spot. There will be other strongman events throughout the season and there is also a points system so he still has opportunities to earn his spot in Columbus next year. It’s hard to make up ground in a strongman event after a poor start and that is unfortunately the situation Heinla found himself in. He posted a 9th place finish in the yoke and in a field of this magnitude, that’s a tough place to come back from. He did tie for second in the log press max and finished 3rd on the power stairs to improve his placing but even after winning the Atlas stones on Day 2 he would need Kearney to make a mistake or struggle if he was going to contend which never happened. Three men from the host country competed in this event. Eddie Williams was the highest placing Australian in the field, finishing 5th overall. Rongo Keene of New Zealand finished 10th overall but impressed the crowd and Arnold Schwarzenegger by taking part in a dance tribute to the 49 people who were killed in the recent shooting in his home land. Jerry Pritchett of the USA started off the weekend well by finishing 2nd in the yoke carry but was dealing with a hamstring injury as the weekend progressed. He still competed in every event and finished 6th overall. Featured Image Credit: Arnold Sports Festival. Permission granted.